Did you know that when you take photos with your Android phone or any digital camera, EXIF data is automatically added to your photos. These photos can reveal too much personal information of yours such as when the photo was taken, manufacturer and camera model, resolution, and other such information. But that’s not all; the photos might also contain location based information, with timing of the photo capture. If you’re really worried and don’t want your personal information to be revealed by your precious photos, then you’ll need to remove this metadata from photos before sharing on Facebook, Twitter or any other site. If you are on Android platform, then the easiest way to do this is to use an app that strips out the metadata. While you can also use a computer to do so, but for that you’ll need to first transfer your Android photos to your computer and then use that program to remove such EXIF data information. 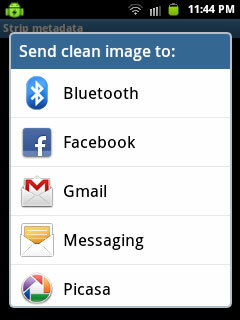 Image Privacy is a free app for Android that strips metadata when publishing images. The application doesn’t come with any interface. To use it, you’ll just need to tap on “Share” menu and then tap on “Strip Metadata” option from the menu. Shortly after that, you’ll get an option which allows you to save your photo, share it on Facebook, Twitter, Google Plus, Picasa, Flickr, or on Dropbox. If you don’t want to share the image anywhere, then simply tap on the back option. That’s it, a new copy of the image will be created with no metadata inside that photo. The new file that this app creates is saved in the exact location where the original file is located. Many of you will love the option to send the stripped photo directly to Dropbox. If you want to bulk process files, then you’ll need to select multiple photos and then hit the Share option. The new copy of the file will have the name prepended with “_stripped_”. This helps you to identify the file which has been stripped out by the app. Don’t worry, the original file will remain intact. The application also does not require any internet connection to process files. Image Privacy does exactly what the name suggests. If you want to strip out your photos/images from potentially compromising information, then this app is for you. Download Image Privacy from Google Play Store.